education system, and how the model could be spread statewide. experts Nova Kim and Les Hook. This week, Vermont Edition is exploring some of the music included in the compilation called Thrufters & Throughstones, a special collection of music celebrating Lake Champlain’s Quadricentennial. 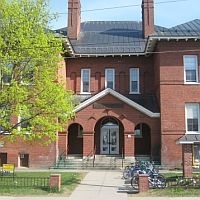 Today we hear "Growling Old Man and Grumbling Old Woman"
Vermont’s first magnet schools will open this fall. Two Burlington elementary schools will re-open as district-wide magnet schools — one with an emphasis on arts, and the other focusing on sustainability.